Aristotle: I am troubled after having viewed a few episodes of the drama, Spiderman, as I cannot class it under any of our traditional Greek dramatic forms. Plato: I, too, share your concern, although the particulars may differ. Aristotle: How so, venerable teacher? I propose that we share these particulars in more detail and come to some form of rational agreement as to what this curious form of drama means. Plato: Let us do so, and I shall take this opportunity to begin. I am troubled by some of the claims of the opening chorus: “Spiderman, Spiderman, does whatever a spider can.” Now, when I reflect upon the eternal form of the spider, I think also of the attributes that would define a spider rather than, say, a goat or a toga. It is evident that we are dealing with a hybrid copy of two forms: spider and man. We know that he is a man primarily attired in a costume that resembles that of a spider, although he still only has four limbs rather than the eight that is customary of any arachnid. It is furthermore stated that he can spin a web, any size, which I suppose is in the domain of actual spiders. What else do we know about spiders as to what they can do? Aristotle: From my observation of spiders, I find that they lay eggs and inject a paralyzing sort of venom into their captured prey. Plato: Can Spiderman lay eggs or inject venom? Plato: Then the claim of doing whatever a spider can must be false. Aristotle: Venerable teacher, I wish to retrace our steps to investigate the four causes of Spiderman: the formal, the material, the efficient, and the final causes. Plato: The formal cause is the idea of a man acting as a spider. A very confused idea. Aristotle: Yes. And the material cause is that he is a man, and he is enabled with some form of apparatus that allows him to spray a sticky fluid from his wrists. Plato: Do spiders have wrists? Certainly spiders do not make webs from their wrists. Plato: But lacks an exoskeleton like spiders possess. Aristotle: And so we are left with the material cause making him much more man than spider. There is also the event of being exposed to some agent that granted him the ability to scale walls and have additional strength. He signals this by dressing up in a costume that only vaguely resembles a spider, although I do not see the resemblance. This would cover the efficient cause. Plato: And the final cause? There must be a purpose to this materialization of the idea, although you know I disagree with your view that matter and idea must both be present to define truth. Plato: So he uses a spider’s ambush qualities, lying in wait. Plato: That statement confuses me. Does light itself have an agenda it must follow, that it can be tardy? Aristotle: That is not the only troubling statement: “Is he strong? Listen, bud, he’s got radioactive blood.” From what we now know about the effects of radiation on the human body, at higher doses this can cause radiation sickness if not cancer. Plato: Hardly congruous with having additional strength. Plato: I suppose it is noble to perform actions such as combatting crime without expectation of reward, financial or otherwise. Aristotle: But how can an action be its own reward? This is imprecise, for just about anything he does that involves motion of any kind would be considered an action. Would it not be preferable to restate the claim for clarity thus: “Wealth and fame, he’s ignored. Preventing or punishing criminals to protect the safety and security of the community is his reward”? Aristotle: Such a fatalist statement that suggests that all life is strife. Plato: Whoever composed these lyrics must be a student of Heraclitus, that all is in flux. I do not agree with this. Aristotle: I am of the same mind. It shows a want of knowledge in the ultimate purpose of the universe. To take the appearance of occasional strife is not sufficient to declare that the universe is chaotic and imbalanced that strife would be the defining feature of all existence. But what make you of this: “Whenever there’s a hang up, you’ll find the Spiderman”? Plato: What is a “hang up”? Aristotle: According to my limited knowledge of twentieth century slang, it can either mean an unanticipated delay or disturbance, or it refers to a psychological problem such as being repressed. Plato: So, this is unclear in either case: is it that Spiderman appears when a hang up appears, or that he causes them by his appearance? Aristotle: Not to mention that if he always appears after a hang up event, then he must have some form of divine powers to appear so quickly. However, if he is causing these events to occur, then this is troublesome. Plato: What if there are two hang ups occurring simultaneously at two different locations? Aristotle: Then he can be in two places at once? Plato: Being in two places at once is not an attribute of either spider or man. All men can only occupy one place at a time. Spiderman is a man, as we have established, and therefore he can only occupy one place at a time. Furthermore, the statement requires correction. Aristotle: Indeed. It should be restated thus: If at some point in time t there is an event such that a hang up occurs at time t, and that event occurs in a particular space s, and there are no other such hang up events at the same time t at a different particular space s’, then it is likely that we will find the Spiderman should he be apprised of such a hang up event at time t at space s.
Performs some of, but not all, the same actions as a spider. Ejects a sticky web-like substance that is not the same as a spider’s web, to a size that he is capable of producing. Catches thieves in a manner slightly resembling that of flies caught in a spider’s web. It is unlikely that his strength can derive from exposure to radiation given that said exposure does not add strength, but hinders health, and so therefore he must have derived his strength from another cause. He has been observed to swing from the sticky web-like substance issued from his wrists when said substance affixes itself to other structures. Look out! - although unless one is a criminal, one should not likely be fearful of him. There goes the Spiderman if he just so happens to be visible to someone at a particular time and place. At the scene of a crime - suggesting that either Spiderman only works at night or crimes are committed only at night, the latter of which seems unlikely - like someone who has been apprised of a crime in progress, he arrives to prevent it at a speed that by definition must be less than that of light itself. Spiderman belongs to a neighbourhood and is considered friendly by some. He’s either ignored or more likely rejected as his purpose. Preventing crimes through his own agency and action to make the community safe functions as both his purpose and reward. To him, life is characterized by strife. Whenever there’s a disturbance of interest to him at a particular time and space, and there is not a simultaneous disturbance elsewhere, and he is apprised of it, he will make his way speedily there to resolve it. Plato: This is more in line with truth, but not very catchy for a chorus to sing. Aristotle: Our concern is philosophy; allow the dramatists to ply their trade. Let us turn to other troubling matters from the actual drama itself. First of all, I have noticed in repeated instances that Spiderman performs the very same actions at the very same locations, swinging toward us or looping around a flagpole. Plato: According to the Muses, they tell me that this was a way of saving money by reusing animation sequences as was done in something called The Flintstones. I do not understand their references. But why is this a problem? Do you travel to the Academy from your home? Plato: And do you take a different route each time, or do you take the most expedient route? Plato: Then it would make sense that Spiderman is taking the same and most expeditious route to wherever he must go, and that this is no different than other men. Aristotle: But we learn that he is attending to the matter of preventing crimes wherever they may occur, so unless they always occur at the exact same location, the route would vary. Plato: I concede the point. Allow me to raise a question of my own: as I observe Spiderman in that curiously coloured sky, one observes him swinging between buildings. Unless the buildings are attached to one another at the top, creating a canopy over the street, to what is he affixing his web-like substance to? Aristotle: Very mysterious. Perhaps there are some manner of flying beasts he attaches to, but ones that stay very still and cooperate with him. I find it unlikely that he would possess enough of the sticky web-like substance to attach to the roof of the celestial sphere. Plato: When he is not in costume, he works as a news reporter, but he is frequently seen setting up a camera to take pictures of the criminals caught by his alter ego, Spiderman. Preventing crimes through his own agency and action to make the community safe is but one of the purposes and rewards he receives, but he also profits from these actions by reporting on them in order to be compensated for his duties as a reporter. Plato: And so a little less noble than we initially judged. I am also curious as to why his employer, J. Johan Jameson, has such an antipathy to Spiderman. 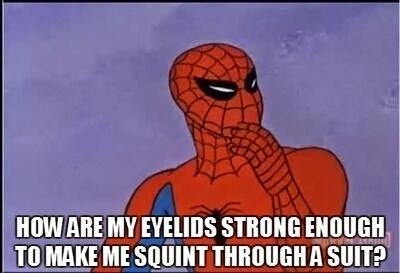 It would certainly explain Spiderman’s need to have a double life. Aristotle: So it might be said that the entire reason for his going in costume is to prevent his employer from making the connection and thus relieving Peter Parker of his duties. Plato: Regardless of any noble motives he may have, which we now must place under scrutiny, there is something morally wrong with his behaviour. Lo! I spy another philosopher. Kant: Hi guys. I was just taking my daily stroll and inadvertently overheard the topic of your discussion. I would like to answer the moral question. Kant: Well, according to my categorical imperative, all moral acts must be such that whatever one does should be universal and thus you would not object said act being done unto you. So, if Peter Parker is willfully deceiving his employer by pretending that Peter Parker and Spiderman are not the same person, he is therefore willing that all people should be able to dress up as someone else and engage in deception. He is also a vigilante, so therefore Peter Parker universally wills that all people are in their rights to take the law into their own hands. Plato: Very troubling with respect to Justice. Aristotle: But it goes some length to determine why he holds to the view that life is strife, that it is anarchic, but that he actually contributes to this. Kant: Precisely. Spiderman wills anarchy as a universal moral value. Plato: Let me attempt to conclude this discussion: Spiderman is a confused idea who is more man than spider, may or may not cause disturbances, holds the view that life is violent and imbalanced, who uses his powers to profit professionally from preventing crime, and believes in anarchy. Therefore, we can state from what we have said that Spiderman is a confused, deceiving, anarchic opportunist. Aristotle: Sounds about right to me.